When building complex layout with RadDocking, the users will often expect to persist the layout from one session to another. This can be easily achieved with the advanced Save/Load layout mechanism of the RadDocking. Create a new application and add the following initial RadDocking declaration. RadDocking gives you the ability to store the entire layout in a stream containing XML. In order to do that you need to use the SaveLayout method of an instance of the RadDocking control. Additionally, you can choose to save the stream elsewhere, in a textbox, or directly in the file system. Set the RadDocking.SerializationTag attached property for each one of the panes in your xaml declaration. 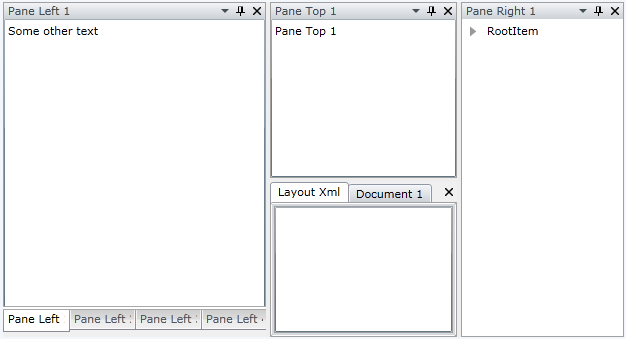 If the SerializationTag is not set the Panes will be removed and new components will be created when the layout is loaded. If you want to preserve not only the Panes and load the same instances when the layout is loading you need to set the SerializationTag to all other components of RadDocking you want to preserve as well (RadPaneGroups, RadSplitContainers, RadPanes). <telerik:RadDocumentPane Header="Document 1" Title="Document 1"
Use the SaveLayout method of the RadDocking class. The following example demonstrates how to save the RadDocking layout in the IsolatedStorage. The generated XML is returned as well. // Save your layout for example in the isolated storage.
' Save your layout for example in the isolated storage. Mark all RadPanes with the RadDocking.SerializationTag. Use the SaveLayout method of the RadDocking to save your layout in a stream. (Optional) Save the stream in the isolated storage. When you load the layout, all the elements that are not marked with SerializationTag property are removed and new components are created instead. That is the reason why you should mark your panes with the SerializationTag attribute. In order to load the docking layout you need to do absolutely the same things but in reverse order. First, load the stream (e.g. from the isolated storage). Second, use the LoadLayout method of the RadDocking control. // Load your layout from the isolated storage.
' Load your layout from the isolated storage. ElementLoading - raised when a docking element (Pane, PaneGroup or SplitContainer) is about to be loaded. The type of the passed event arguments is LayoutSerializationLoadingEventArgs. LayoutSerializationLoadingEventArgs - provides access to the AffectedElement, AffectedElementSerializationTag, ElementProperties properties and the Cancel property that determines whether the AffectedElement will be loaded. ElementLoaded- raised after a docking element (Pane, PaneGroup or SplitContainer) is loaded. The type of the passed event arguments is LayoutSerializationEventArgs. ElementSaving - raised when a docking element (Pane, PaneGroup or SplitContainer) is about to be saved. The type of the passed event arguments is LayoutSerializationEventArgs. ElementLayoutSaving (introduced with R2 2016 of UI for WPF) - raised when a docking element (Pane, PaneGroup or SplitContainer) is about to be saved. The type of the passed event arguments is LayoutSerializationSavingEventArgs. LayoutSerializationSavingEventArgs - provides access to the AffectedElement, AffectedElementSerializationTag, ElementProperties properties and the Cancel property that determines whether the AffectedElement will be serialized. ElementSaved - raised after a docking element (Pane, PaneGroup or SplitContainer) is saved. The type of the passed event arguments is LayoutSerializationEventArgs. ElementCleaning- raised when a docking element (Pane, PaneGroup or SplitContainer) is about to be cleaned. The type of the passed event arguments is LayoutSerializationEventArgs. ElementLayoutCleaning (introduced with R2 2016 of UI for WPF) - raised when a docking element (Pane, PaneGroup or SplitContainer) is about to be cleaned. The type of the passed event arguments is LayoutSerializationCleaningEventArgs. LayoutSerializationCleaningEventArgs - provides access to the AffectedElement, AffectedElementSerializationTag properties and the Cancel property that determines whether the AffectedElement will be removed from the layout. ElementCleaned- raised after a docking element (Pane, PaneGroup or SplitContainer) is cleaned. The type of the passed event arguments is LayoutSerializationEventArgs. CustomElementLoading- raised when a custom docking element (that derives from RadPane, RadPaneGroup or RadSplitContainer) is about to be loaded. The type of the passed event arguments is LayoutSerializationCustomLoadingEventArgs. AffectedElement- this is the currently loaded\saved pane. AffectedElementSerializationTag- this is the currently loaded\save serialization tag. In the previous example if you attach to any of the events, then the first time when the AffectedElementSerializationTag is fired, it will have the value "LayoutXml". ElementProperties - this is a Dictionary that contains the string representations of the DependencyPropertys of the AffectedElement that will be saved to the layout Xml of the RadDocking. CustomElementTypeName - it gets the type name of the custom affected element. Cancel - determines whether the custom AffectedElement will be loaded. The Telerik.Windows.Controls.LayoutSerializationLoadingEventArgs allows you to point out an instance to be used as a newly loaded control. This could be useful if you need to create the instances yourself. You have the ability to "say" whether these event to be fired or not, when the SerializationTag is not specified. You should use the second overload of the LoadLayout and SaveLayout methods. By default when you use the SaveLayout method only the layout (without the content) will be saved. That's why the most common use of the fourth events is to save (respectively load) the pane's content. In order to see how to do that take a look at the Save/Load the Content of the Panes topic.